Five counties that were hammered by Hurricane Ophelia are now on high alert for flooding amid warnings of a potential "weather bomb" due to torrential rainfall and high tides. Met Éireann has issued two Status Orange warnings and three Status Yellow warnings as Storm Brian is set to strike later today. Storm Brian will spell further misery for tens of thousands of households still without electricity and water following Ophelia on Monday. News of the storm came as Taoiseach Leo Varadkar briefed his fellow European leaders in Brussels on the damage wreaked by Ophelia. The European Council agreed to examine the rules around the European Solidarity Fund with a view to making it easier for countries to draw funds from it. The latest storm will bring potential wind gusts of up to 110kmh to 130kmh from this evening until lunchtime tomorrow. However, most concern will surround the fact that potentially up to 50mm of rainfall will hit parts of Cork, Tipperary, Waterford and Limerick. Coupled with a high tide in Cork, there is now a fear of flooding along low-lying coastal areas and parts of Cork city centre. There is a risk of coastal flooding across the south and south-west. Met Eireann forecaster Evelyn Cusack told RTÉ's Morning Ireland that gale force winds are expected tonight. "Yesterday we had up to 30 millimetres of rain. It's a lovely sunny morning but there's another spell of rain coming up the country with about 20 to 50 millimetres of rain between today and tomorrow. This could lead to a risk of local flooding. Winds are picking up steadily today and Storm Brian as we've called it will be gradually pushing in this evening and tonight. There will be strong to gale force winds this evening and tonight and tomorrow veering west to north west. "It's going to get very stormy tomorrow through some western and southern areas. "There will be very high seas so there will be risk of coastal flooding and do take the warning of the coastguards seriously and don't go out because huge Atlantic waves will be crashing on the west-coast." Ms Cusack said that trees that were damaged by Storm Ophelia may be at risk of falling due to the strong winds. "Because it's a depression, all of the directions are changing." She added that it will last until Saturday night. "It looks much better on Sunday. There's no indication of any more storms next week. Take care everyone." 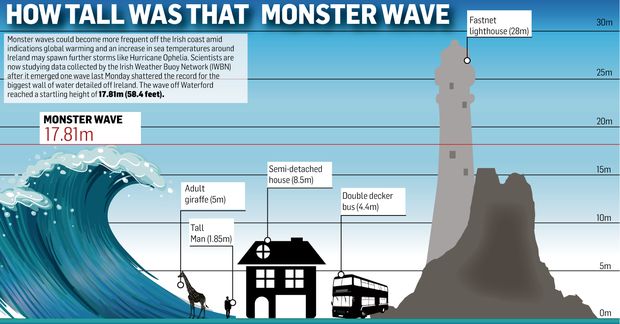 The Irish Coast Guard has advised people to stay away from the coast. "During periods of stormy weather, we're asking people to take extra care. Rough seas and extreme weather might look exciting, but getting too close can be risky. So respect the water and, in particular, avoid exposed places where big waves could sweep you off your feet. "The Coast Guard strongly advises the public to stay away from exposed beaches, cliffs and piers, harbour walls and promenades along the coast tomorrow. "Remember to ‘stay back, stay high, stay dry’. "If you see someone in difficulty in the sea, on the shore dial 999/112 and ask for the Coast Guard." Councils are working to ensure drains and culverts are clear of debris left from Ophelia so that the rainfall from Storm Brian can be handled. Met Éireann said that while Storm Brian will not be anywhere near as destructive as Ophelia, it is feared it could hamper the work by Electricity Supply Board (ESB) and Irish Water repair crews to tackle damage to networks caused by fallen trees. Cork, Clare, Kerry, Waterford and Wexford face both wind and rainfall warnings. An Orange warning is also in effect for Galway and Mayo. Residents can expect gusts of between 110kmh and 130kmh, but that warning is in place from 6am to 6pm tomorrow. A Status Yellow wind warning has been issued for the entire country from 10pm today for 24 hours, with mean wind speeds of 65kmh likely to again batter Ireland. 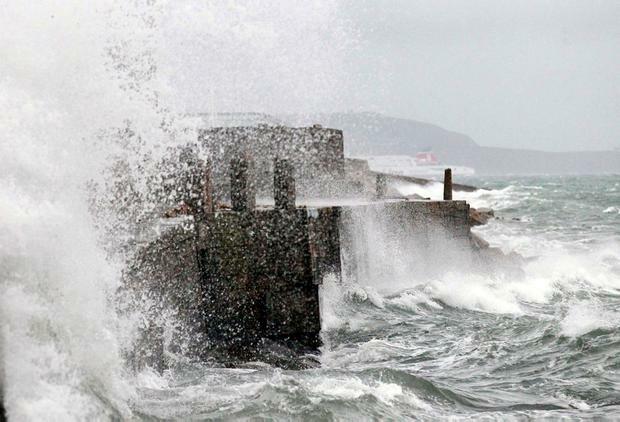 Met Éireann warned there was a potential for gusts up to 110kmh at times in some areas. "The system that may become Storm Brian will undergo explosive cyclogenesis [weather bomb or rapidly deepening pressure system] in the next 24 hours," a spokesperson said. Torrential rainfall throughout yesterday caused localised flooding around Cork, Waterford and Tipperary. In Cork, worst hit were roads in the Mayfield, Glanmire, Bishopstown and the quays areas of the city. With heavy rainfall forecast overnight, the greatest risk of flooding will be in Cork city between 9am and 6pm today when tides will reach their highest point. Meanwhile, Ireland may be able to avail of EU funds to fix damage from Storm Ophelia, but the necessary repairs will take place regardless of whether an application is successful or not, Taoiseach Leo Varadkar has pledged. And he said efforts continue to reconnect thousands of homes that are still without power and electricity after Monday's storm which brought hurricane force gusts of wind. Mr Varadkar was speaking after last night's European Council meeting in Brussels where he briefed other EU leaders on the storm. Deadly forest fires in Spain and Portugal were also discussed and it was agreed the EU needs a better way to coordinate their response to emergencies. The Taoiseach said this morning: "We asked the [European] Commission to take a look at how the European Solidarity Fund works so that it might be possible for more countries to avail of that." Earlier this week Mr Varadkar said that while the cost of the storm damage is still being assessed, it almost certainly doesn't reach the current threshold for EU solidarity funding. Now EU leaders have agreed to examine the rules around the European Solidarity Fund with a view to making it easier for countries to draw down funds from it. Mr Varadkar said there is a prospect that Ireland may be able to draw down the funds for Storm Ophelia damage. "We have 12 weeks to apply and during those 12 weeks it is possible that the rules will be changed to allow us avail of it. "But I should say the EU Solidarity Fund isn't going to prevent us from carrying out the repairs that are necessary. They're going to happen anyway. "I did thank Prime Minister Theresa May and President Emmanuel Macron yesterday for the assistance that we're getting from French and British and Scottish power crews who were coming over to help us to connect people back to the power network." Mr Varadkar also said: "I'm very conscious of course that even today there is still tens of thousands of people in Ireland without power and some without water as well and I want to assure people that we're doing everything we can to connect people as quickly as we can."